act now to issue a final regulation to require the following information on all beer, wine, and spirits labels: serving size, calories per serving, alcohol per serving, percent alcohol by volume, the definition of a “standard drink,” number of drinks per container, and the Dietary Guidelines recommendation on moderate drinking. 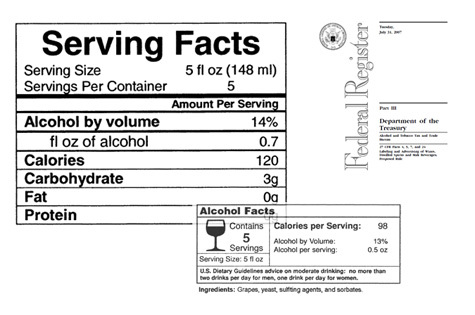 TTB also should consult with FDA as to the most effective format and graphic design for the “Alcohol Facts” label. The four consumer groups are the Center for Science in the Public Interest, the Consumer Federation of America, Shape Up America!, and the National Consumers League. They say they have been waiting more than five years since submitting their petition to change these rules. TTB’s 2007 proposed rule, and thousands of comments, are here.